EDITOR’S NOTE: Updated Oct. 3 with 24-hour launch delay to Oct. 7. A Falcon 9 rocket powered by a recycled first stage lit its main engines for a hold-down firing on a launch pad Tuesday at Vandenberg Air Force Base in California in preparation for launch with an Argentine radar satellite on a mission that will feature the first SpaceX booster landing on the West Coast. 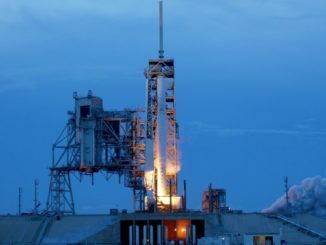 SpaceX announced the completion of the static fire test in a tweet shortly after 2 p.m. PDT (5 p.m. PDT; 2100 GMT) Tuesday, confirming that the Falcon 9 launch was on track for Saturday at Vandenberg Air Force Base, a military-run spaceport on California’s Central Coast northwest of Los Angeles. But the launch company announced Wednesday a 24-hour delay in the liftoff to Sunday night. Liftoff is scheduled for 7:21 p.m. PDT Sunday (10:21 p.m. EDT; 0221 GMT Monday) from Space Launch Complex 4-West at Vandenberg with Argentina’s SAOCOM 1A radar Earth-imaging satellite, according to a statement from the Air Force. 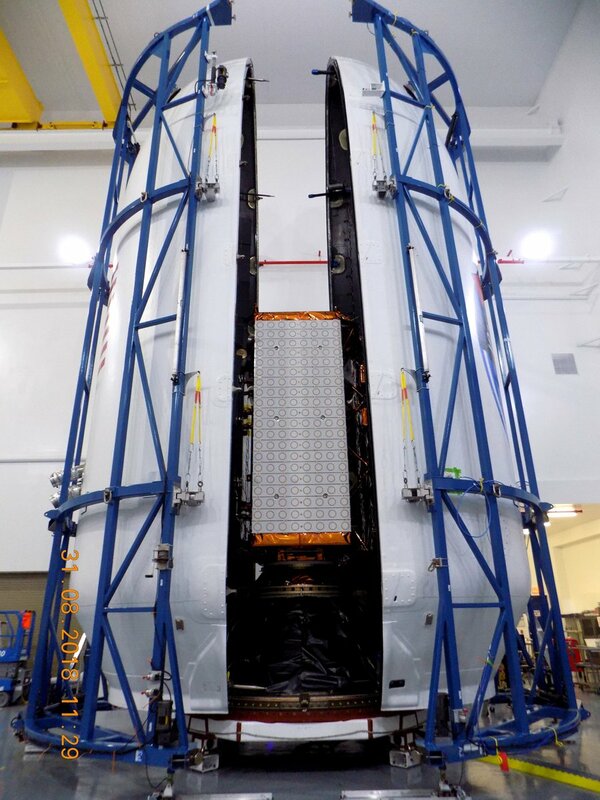 The SAOCOM 1A spacecraft will be installed on the Falcon 9 rocket later this week, after ground crews lower the launcher from its SLC-4W launch pad and return it to a nearby hangar. A photo shared on Twitter showed the Falcon 9 rocket and its strongback structure vertical at the launch pad Tuesday evening, as a freight train rolled along a railroad track nearby overlooking the Pacific Ocean. SAOCOM 1A arrived at the launch base in early August to begin final pre-flight preparations after riding an Antonov An-124 cargo plane from an airport near the satellite’s factory in Bariloche, Argentina, to California, with stops in Cancun and a customs check in Los Angeles before landing on the runway at Vandenberg. The satellite’s purpose is to scan the Earth with an L-band steerable synthetic aperture radar, enabling all-weather imagery of the planet day and night. Radar imagers can see through clouds and are effective 24 hours a day, but optical cameras are hindered by clouds and darkness. SAOCOM 1A is the first of two identical radar observation satellites developed by CONAE, Argentina’s national space agency, and manufactured by a consortium of Argentine companies led by INVAP. The new radar satellite will help measure soil moisture, and will watch for oil spills, floods, wildfires and other natural and human-caused disasters. The soil moisture data will provide scientists and agricultural planners information about the wetness of soil to a depth of more than 6 feet, or 2 meters, information that will help predict harvest yields, floods and droughts. SAOCOM 1A is the first radar imaging satellite built in Argentina, and it will comprise part of a joint Argentine-Italian project to share complementary radar surveillance data between the SAOCOM satellites and Italy’s Cosmo-SkyMed constellation. For the first time, SpaceX will attempt to bring the Falcon 9’s first stage booster back to land at Vandenberg, following a return trajectory pioneered on missions launched from Cape Canaveral. On previous flights from California, SpaceX has recovered Falcon 9 first stages on a drone ship in the Pacific Ocean. 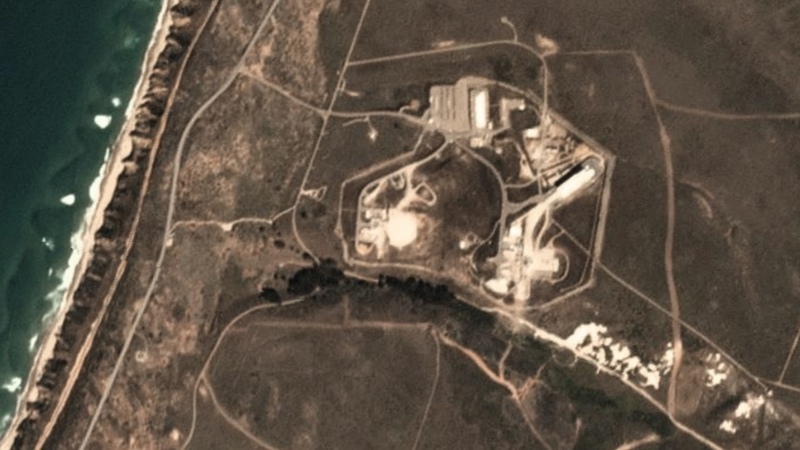 The concrete landing zone at Vandenberg is similar in appearance to SpaceX’s landing pads at Cape Canaveral. But the rocket’s return point in California is much closer to SpaceX’s launch pad than the landing zone in Florida. SpaceX signaled earlier this year its intention to attempt the first rocket landing at Vandenberg, following lengthy environmental and safety reviews by the Air Force, the Federal Aviation Administration, NOAA, and state authorities. Regulators examined how the returns might affect wildlife and natural resources, including seals that could be spooked by sonic booms. The Air Force said in a statement Tuesday that residents around Vandenberg Air Force Base may hear sonic booms as the rocket comes back to Earth for a propulsive landing. “Local residents may see the first stage of the Falcon 9 returning to Vandenberg AFB, including multiple engine burns associated with the landing,” the Air Force said in a statement. 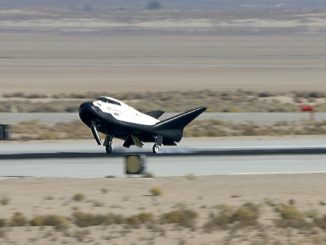 “During the landing attempt residents from Santa Barbara, Ventura and San Luis Obispo counties may hear one or more sonic booms. SpaceX has named its landing pad at Vandenberg Landing Zone 4. It was formerly named Space Launch Complex 4-West, a sister pad to the SLC-4E launch facility now used by the Falcon 9 rocket. The Air Force used SLC-4W for Titan 3B and Titan 2 rocket launches through 2003. The Air Force toppled the Titan 2’s launch towers in 2014, and SpaceX leased the site from the military in 2015 to reconfigure the property into a landing pad. The SLC-4E pad was once the West Coast home of the Titan 4 rocket. While SpaceX’s landing zones at Cape Canaveral are several miles from the Falcon 9 rocket’s launch pads, the landing zone at Vandenberg is just a quarter-mile — around 400 meters — from the Falcon 9’s liftoff point at neighboring SLC-4E. 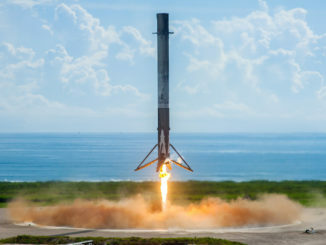 Onshore rocket landings are less expensive for SpaceX, and they save time for engineers inspecting and refurbishing the boosters for future missions. The deployment and return to port of a drone ship and its support vessels can take up to a week, assuming an on-time launch. On missions with relatively light-mass payloads going into low-altitude orbits, the Falcon 9’s first stage stage can reserve enough propellant for the engine burns required to steer it back to its launch base, rather than arcing downrange to a drone ship in the ocean. Planet, which operates a fleet of more than 100 Earth-imaging satellites, released a pair of photos Monday taken from space showing changes at SpaceX’s West Coast launch and landing sites between Sept. 20 and Sept. 30. The imagery shows the rocket’s circular landing zone on the left — just inland from the Pacific Ocean — and the Falcon 9 launch pad on the right. The first stage booster assigned to SAOCOM 1A previously flew July 25 on SpaceX’s seventh launch of Iridium Next communications satellites, then landed on the company’s offshore drone ship. Sunday night’s flight will mark the 16th time SpaceX has reused one of its rocket boosters on an orbital mission. 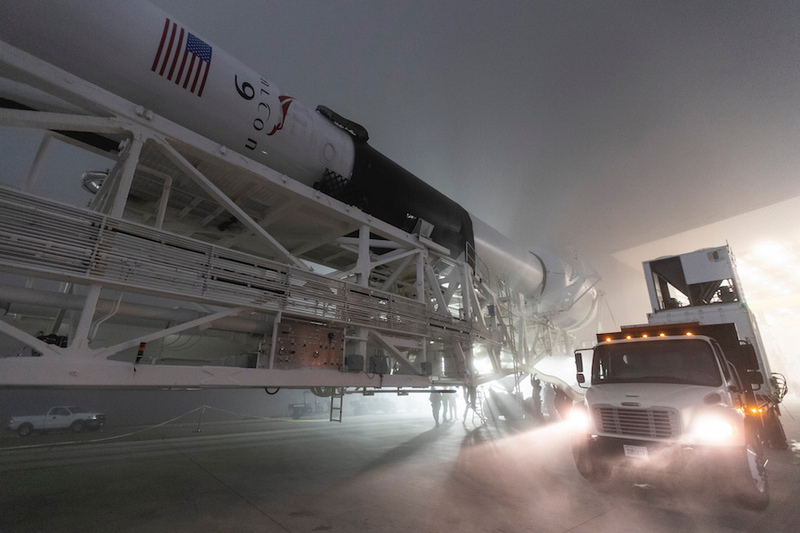 SpaceX could also try again to catch part of the Falcon 9 rocket’s nose shroud, an aerodynamic fairing the protects the SAOCOM 1A spacecraft during its climb into orbit. The company’s net-equipped fairing-catcher, a high-speed boat named “Mr. Steven,” may be dispatched into the Pacific Ocean to try and catch fairing as it descends back through the atmosphere. Like the reuse of the Falcon first stage, SpaceX aims to recover and re-fly fairings to further cut launch costs.